The colorful vines lining the hills of J. Wrigley vineyards combat the dark and rainy gloom that embodies Oregon in October. 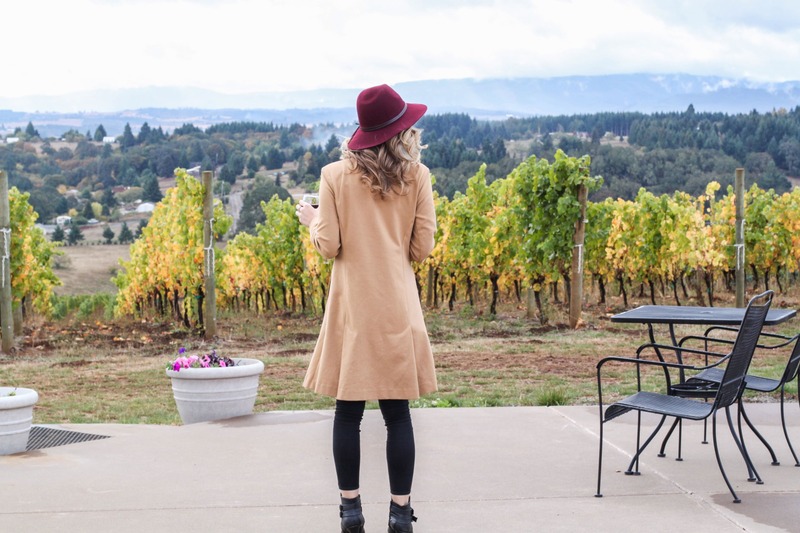 Perched atop one of the larger hills in the Willamette Valley, I have a birds-eye view of the surrounding vineyards and forests from the tasting room’s patio. During the summer the area would buzz with tourists and traffic noise, but today it’s silent. Harvest has come and gone, school is back in session, and the rainy fall weather deters most area oenophiles from venturing out for a day of wine tasting. I have this winery (and seemingly the entire AVA) to myself. I drink in the solitude of wide open spaces and savor the silence as I sip my pinot noir. In this moment of utter content, it’s easy to forget that mere hours prior I was battling my way through the bustling streets of Portland only to find myself stuck in traffic on my way out of the city. Right now, however, the hustle and bustle of the city seems worlds away. That’s one of the things I love most about Oregon; from the main metropolis of Portland, you can drive less than three hours and be among rivers, forests, waterfalls, mountains, vineyards or coastlines, depending on which direction you choose to drive. This accessibility to numerous diverse experiences makes Oregon a weekend warrior’s wonderland. 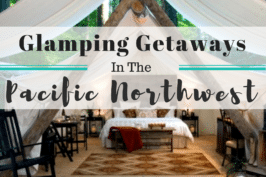 Today, I’m teaming up with Trivago to share eight of my favorite Oregon weekend getaways that are sure to satisfy your two days of freedom. 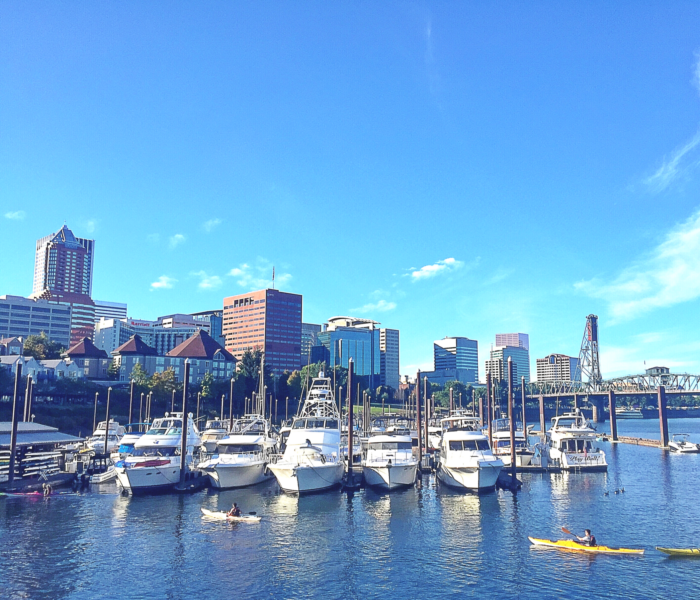 Ah Portland, a city renowned for rain, beverages, bridges and hipsters (thanks in part to the hit show Portlandia) is a tapestry of food, wine, beer, culture, art and outdoor experiences, all woven into one energetic — albeit “weird” — city. Portland, Oregon is a confluence of chaos and creativity, a city as diverse as the people who inhabit it. In its beautiful mess of mélange, it caters to various types of visitors. Foodie? Portland has one of the best culinary scenes in the country. Craft beer connoisseur? Portland has been called the craft beer capital of the USA. Wine? We’ve got that too. Art? Culture? Outdoors? Yep. Yep Yep… But I digress. If you’re visiting Portland bring your appetite, leave your umbrella (you want to fit in don’t you?) and prepare for a whirlwind weekend — there’s so much to do and so little time! But, first things first: brunch. Brunch is somewhat of a religion in Portland, and the city’s breakfast establishments do it well. If patience is your virtue, Tasty & Alder is renowned for its unique brunch offerings and their innovative dishes are worth the unavoidable wait. However if you’re looking for something on the lighter side, Voodoo Doughnuts boasts questionably named yet decidedly delicious doughnuts that are sure to satisfy your sweet-tooth. From VooDoo Doughnuts, you can walk across the street to the Portland Saturday Market (the largest continually operated outdoor market in the US) or stroll along the beautiful Portland Waterfront. 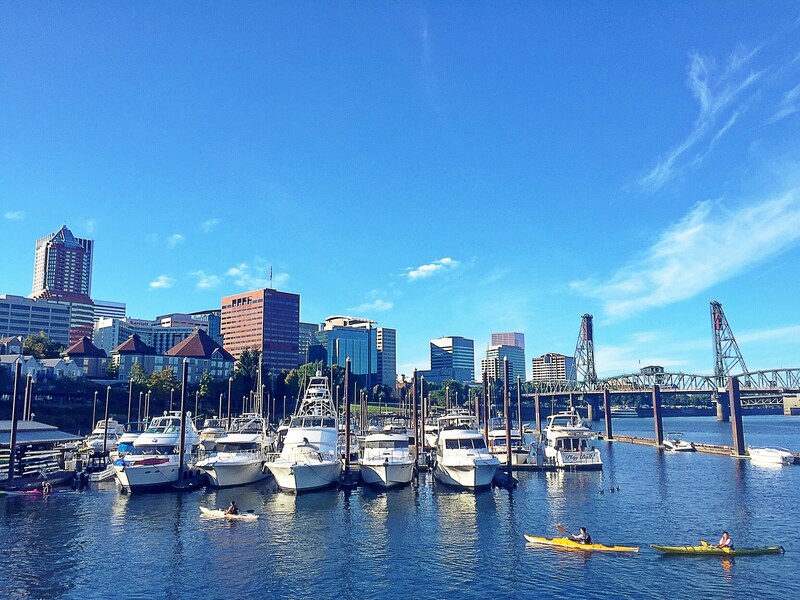 If you’re visiting during the summer months, there’s a revolving door of events that take place nearly every weekend (many at Tom McCall Waterfront Park) so be sure to do your research and avoid missing out on some of Portland’s most famed festivals. Known as one of the premier Pinot Noir producing areas in the world, the 150 mile long Willamette Valley is home to more than 500 wineries. 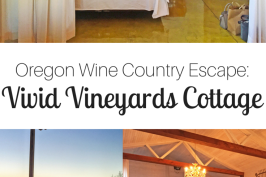 If you like wine (especially pinot) you’ll love spending a weekend in Oregon wine country. In the Willamette Valley personal, handcrafted wine takes precedence over corporate, mass-produced labels. Here, large vineyards are complemented by boutique, family-owned wineries and the passion required to succeed in a challenging cool-climate growing region is evident in every person you encounter and wine you taste. Boasting beautiful views and great indoor and outdoor tasting establishments, valley wineries are a year-round destination. The Yamhill-Carlton AVA & Dundee Hills are among the most popular tasting regions due to their close proximity to Portland. If you’re visiting Yamhill-Carlton AVA don’t miss: WillaKenzie Estate, Anne Amie Vineyards, Elk Cove Vineyards, Soléna Estate and Soter. If you go the Dundee Hills route, don’t miss Durant Vineyards, White Rose Estate, Domaine Drouhin and Domaine Serene. 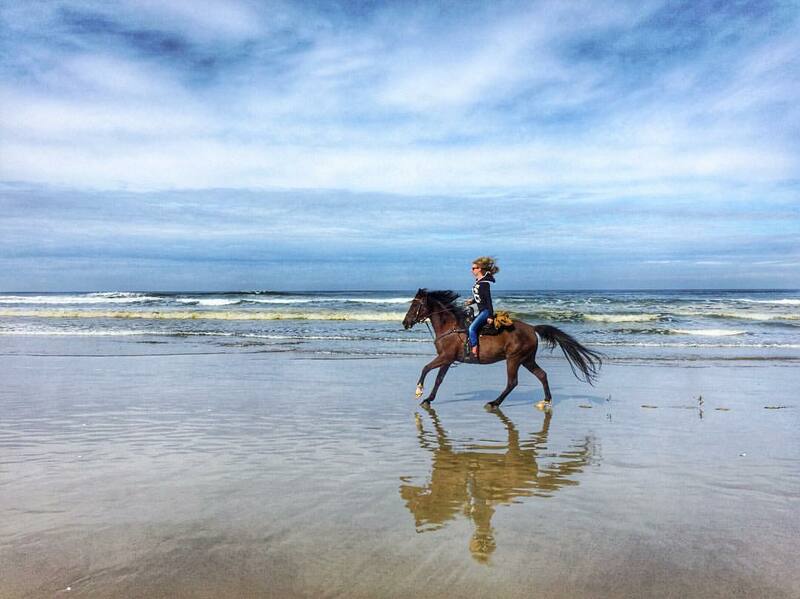 The Oregon Coast has a rugged, wild beauty that’s unlike any other beach in the nation. Although numerous beautiful beach towns fringe Oregon’s 363 miles of coastline, Florence is a local favorite. Situated between the Siuslaw River and miles of sand dunes, Florence, Oregon offers a great getaway for both adventure seekers and relaxation retreaters. 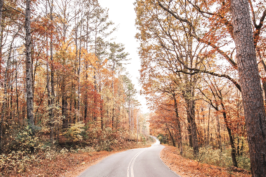 Outdoor enthusiasts flock to Florence for its ample amount of outdoor recreation options. Home to the largest expanse of coastal dunes in the country, adrenaline chasers can bring an ATV, rent a quad or join a Dune Buggy tour to cruise this stretch of sand stacks at a dizzying pace. On the other hand, if you’re looking for something slightly slower and less nauseating, ride horses on the beach (with C&M Stables) or take a hike on the scenic trails that surround the historic Heceta Head lighthouse. The nearby Sea Lion Cave — touted as the largest sea cave in America — is also a favorite among family visitors. After a day of exploring head to Old Town for dinner along Florence’s historic waterfront. Plan ahead and make dinner reservations at the Waterfront Depot. Located inside an old train depot, the restaurant serves up creative dishes and beautiful river views. On September 3rd, 2017 Oregonians everywhere watched in horror, despair and anger as a fire ravaged one of the nation’s most beautiful scenic areas: the Columbia River Gorge. By the end of that Labor Day weekend the fire claimed 48,000 acres of the most beloved forest in the state, taking with it some of Oregon’s most popular hiking trails, most beautiful landscapes and most accessible wilderness. While the Eagle Creek fire caused significant economic, emotional and environmental damage, the Gorge as a natural wonder was neither lost nor destroyed. Today there are still numerous outdoor recreation options to explore and trails to trek. Those hoping to spend a weekend chasing waterfalls need only cross the historical “Bridge of the Gods” to find beautifully in-tact hiking trails that boast vista views and waterfalls. Some waterfall hikes that weren’t affected by the fire include: Cape Horn Loop, Hamilton Mountain Loop, Panther Creek Falls Hike, and Falls Creek Falls Loop. In addition to an abundance of outdoor recreation, the Columbia Gorge is also home to 50+ vineyards and a growing number of breweries, making it an ideal destination for a weekend of wine (or beer tasting). 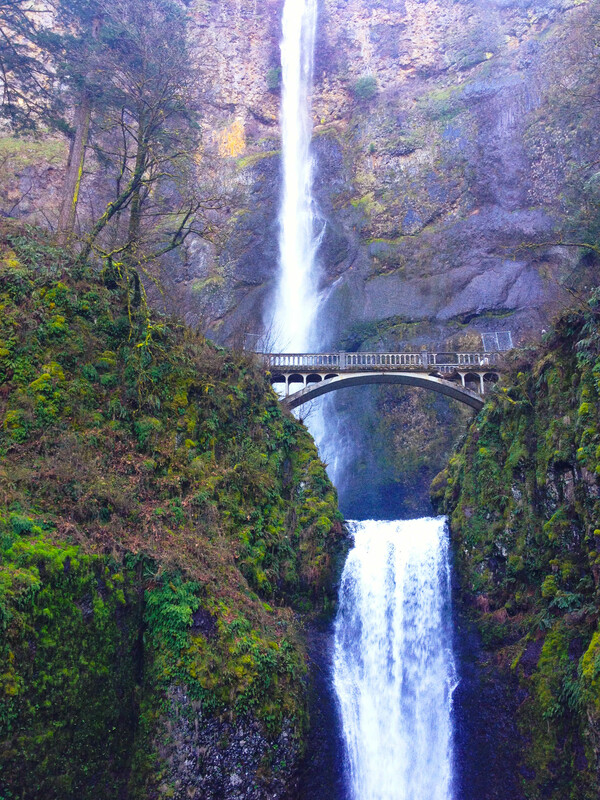 After a day of tasting or trekking around the Gorge, head to Hood River for some farm-fresh dining at Celilo Restaurant and Bar or enjoy a romantic fireside dinner at Multnomah Falls Lodge (located at the base of the famous 620-foot Multnomah Falls). Small in size yet big in adventure, Bend Oregon is a mecca for outdoor enthusiasts. Home to 300 miles of single-track mountain biking trails, 22 golf courses, 15 mountains, 30+ cascade lakes and 300+ days of sunshine a year to enjoy these vast outdoor offerings, Bend is a natural playground for families an adventure travelers. Enjoy world-class skiing (at nearby mount Bachelor) in the winter, or world-class river activities (on the mighty Deschutes River) in the summer months. 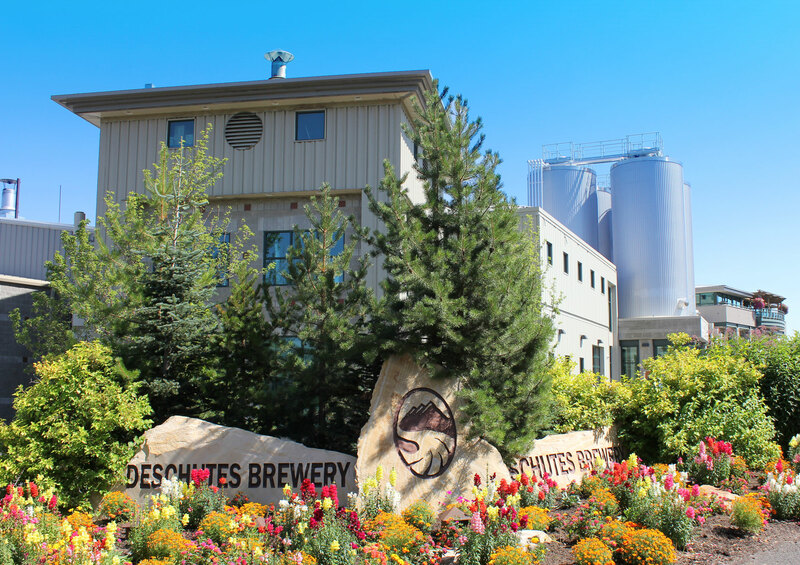 After exploring Bend’s nirvana of nature, enjoy some refreshments at one of Bend’s 25+ craft breweries (or, if you really love beer, taste your way along the Bend Ale Trail). Boasting the largest amount of breweries per capita than any other city in Oregon, Bend is a bucket-list destination for beer lovers. End your day with dinner (and more beer) at McMenamins Old St. Francis School. Known for their atmosphere and sense of community, McMenamins restaurants have been a neighborhood gathering spot throughout Oregon and Washington since 1983. Each McMenamins pub is themed to match the neighborhood in which it resides. Therefore, Bend’s Old St. Francis School pub serves up Northwest fare inside a converted 1936 Catholic school-house, with eclectic decor that pays homage to the history of the school and the surrounding community. 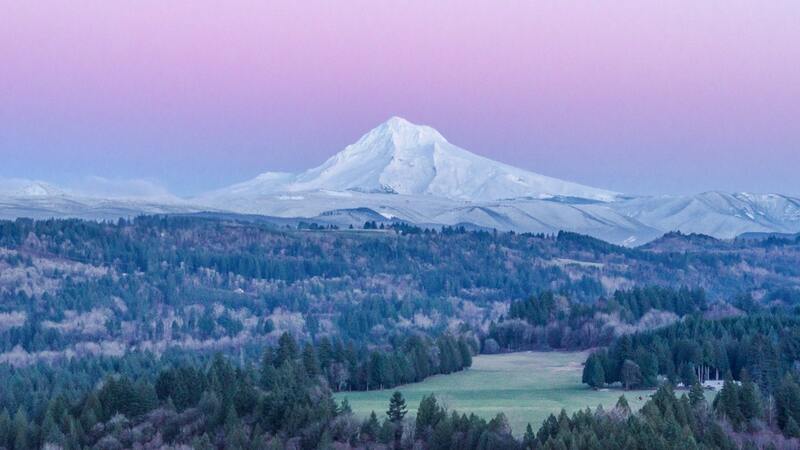 Located 50 miles east of Portland, Mount Hood’s postcard-perfect peak is a dominant point on the city’s skyline and the muse of local photographers and outdoor enthusiasts alike. On a clear day the snow-capped summit (visible all the way to the Columbia River plateau) beckons adventure seekers to explore its glaciers, forests and rivers. With year-round opportunities for snow sports (thanks to the aforementioned glaciers) and scenic summer activities (climbing, hiking, camping, kayaking, etc.) Mount Hood is an outdoor playground for weekend warriors of all stripes. Not only is magnificent Mount Hood Oregon’s tallest mountain, it’s also the second most climbed mountain in the world. Whether you’re hoping to scale the mountain’s glacial summit, trek it’s numerous picturesque trails or ski, sled or snowboard down its infamous slopes, Mount Hood offers visitors numerous recreation options to fill up a weekend. Though several small resort towns encircle the mountain, Government Camp (or “Govy”) is among the most popular. Despite being the gateway to several world-class ski resorts, Government Camp — unlike its canadian (Whistler) and Californian (Mammoth) counterparts — propagates little pretension, but rather provides a warm welcome, and vast apres ski offerings, to visitors. If you’re passing through Government Camp on your way to, or from, Mount Hood stop for hearty meal at the iconic Huckleberry Inn cafe. The Inn’s throwback 24/7 diner has been serving up Huckleberry pancakes, shakes and pie (among other diner staples) since 1966. 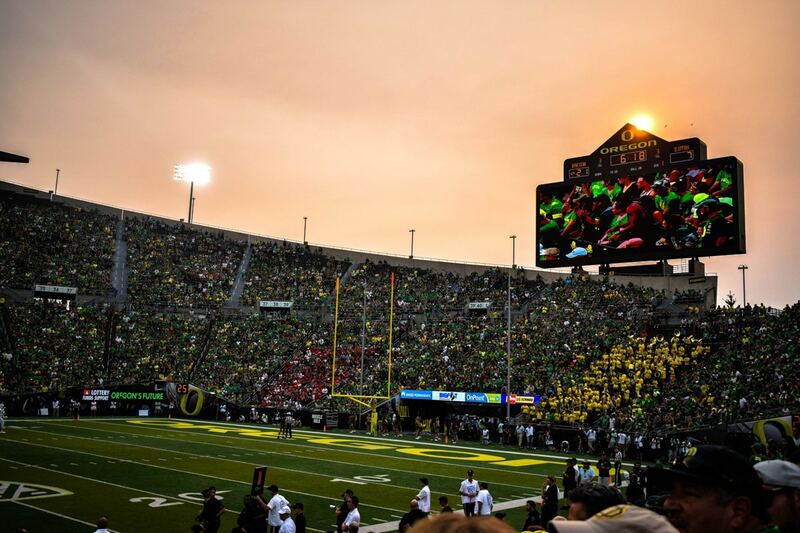 What’s the first thing that comes to mind when thinking of Eugene, Oregon…Nike? Probably. Hippies? Maybe. University of Oregon? Hopefully. However, beneath the town’s awesome college (go Ducks!) and its famous alums (looking at you, Phil Knight) resides a colorful city crammed with creativity and diffused with diversity. Situated at the junction of Oregon’s Willamette and McKenzie rivers, Eugene may be cumulatively considered a “college town” rooted in the hippie movement and counterculture. However, with a dichotomous mix of arts and culture, sports and outdoors, shopping and dining, and yes, liberal politics and alternative lifestyles, eclectic Eugene is a utopia of arts and adventure (and the activities that naturally follow: eating and drinking). Like many other cities in Oregon, Eugene is a hotbed for craft breweries. If you love beer, spend some time wandering the Eugene ale trail and you may meet your new favorite brew. For the wine lovers, Eugene also has a great urban wine scene. After tasting your way through town, head down to 6th Street Public Market for a farm-to-table dinner at Marche. Since a little company called Nike was founded in Eugene, the city has become known as Tracktown USA — an epicenter for athletes and repeating host to the US Olympic (track & field) trials. Runners and cyclists love Eugene’s 250 miles of bike and running trails (located right in town), while outdoor enthusiasts enjoy hiking the nearby Spencer’s Butte or Mount Pisgah. With Eugene’s abundance of parks, trees and trails, anyone wanting to spend some time outdoors will love a weekend getaway to this green city. For nature enthusiasts, Oregon’s only national park is an awe-inspiring weekend getaway destination that attracts nearly one million visitors each year. Located in a remote area of Southern Oregon, what Crater Lake National Park lacks in amenities it makes up for in beauty. Though park-goers can take in the stunning scenery while camping, hiking or picnicking, the park’s rim drive is among the most popular pursuits. This route (self guided in your own car, or guided in a trolley tour) provides gorgeous lake views from various different angles and perspectives. 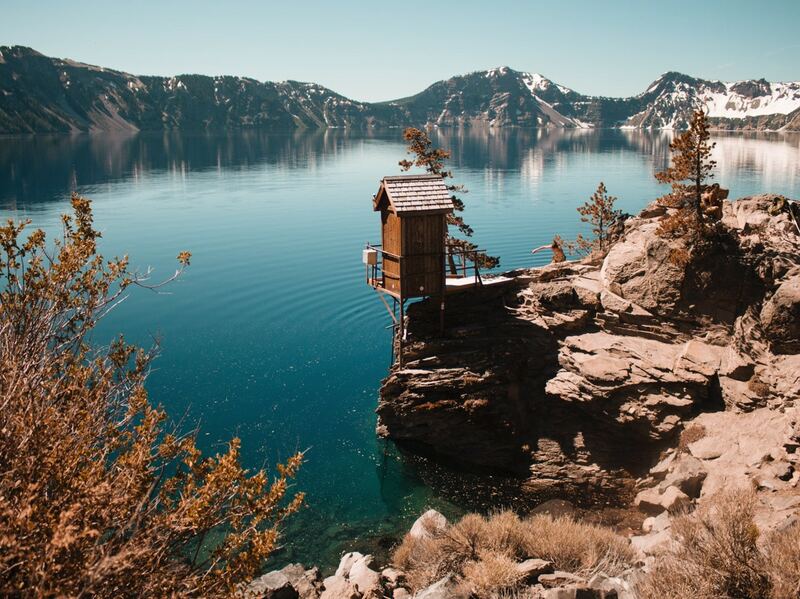 With a depth of 1,943 ft Crater Lake is the deepest lake in the United States, and arguably the most beautiful. Surrounded by cliffs (some reaching up to 2,000 ft) the lake is fed entirely by rain and snow, the purity of which gives the lake its intense blue color. In fact, scientists consider Crater Lake to be the clearest and cleanest (large) body of water in the world. If you’re visiting, consider bringing fishing gear and catching your own dinner. In addition to crystal clear waters and breathtaking scenery, Crater Lake also boasts a superabundance of rainbow trout and kokanee salmon. And, since the lake contains a million salmon (literally) you’re odds of catching something are fairly favorable. However, if you opt to find food elsewhere your dining options become much more limited, as there are only three restaurants in the park. That said, the Crater Lake Lodge dining room is a spectacular place to have a meal while enjoying magnificent lake views (just make sure you get a reservation if you are visiting during the summer). Eugene, Oregon is an exciting place for tourists and locals! a beautiful city with an incredible history. Thanks for the information! As native Oregonian, I must say this is a pretty good list! I also love Cannon Beach on the Oregon Coast. We often vacationed there in my childhood. Portland is always fun. Good list to explore Oregon! We went a couple of times to Portland, mostly around the Hood River, but also explore the wine area and the coast – loved it! I road tripped along the Oregon Coast several years ago and ever since that trip I’ve wanted to return to explore more. This gave me some ideas of where to start. I have a newfound love for Oregon but there’s still so much I didn’t get to experience on my first trip. I’d love to see Mount Hood up closer, visit Crater Lake, and spend more time along the coast. I’m hoping to go back soon!